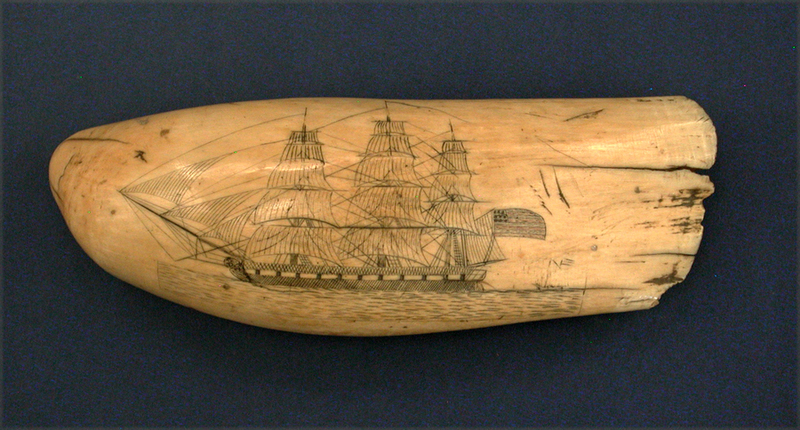 EARLY SCRIMSHAW TOOTH decorated both sides with American ships. One side with naval frigate that flies a large American flag with subtle red coloring. The reverse with another ship that also flies an American flag with red coloring. Overall condition very good noting typical but sound age cracks. Deep, desirable age patina over entire surface. Circa 1830-40. 6 3/4" l. By the same maker as the example illustrated on page 67 in JFK Scrimshaw Collection book. Another example by this artist recently sold at Mittler Collection auction for $12,000.00. That tooth was originally sold by us back in 1991 in our catalog number 24. Overall a very nice piece of 19th century American scrimshaw.